TORONTO, ONTARIO--(Marketwired - Feb. 11, 2016) - Red Pine Exploration Inc. (TSX VENTURE:RPX) (the "Company" or "Red Pine") will mobilize this week to begin the process of logging/sampling over 42,000 metres (m) of historic core. The historic core library available on-site will be a key element to define additional gold resources in the Wawa Gold Corridor and will save the Company an estimated 4.2 million dollars of drilling costs. The core is primarily from holes drilled into the Surluga Deposit, with little to no sampling in the areas outside the Jubilee Shear Zone that contains the entirety of the inferred resource. Red Pine's program will sample known and newly identified gold bearing intersections in the hanging wall material of the Surluga Deposit with the intent of adding these to the existing inferred resource1 (Figure 1: http://media3.marketwire.com/docs/2550a.jpg). 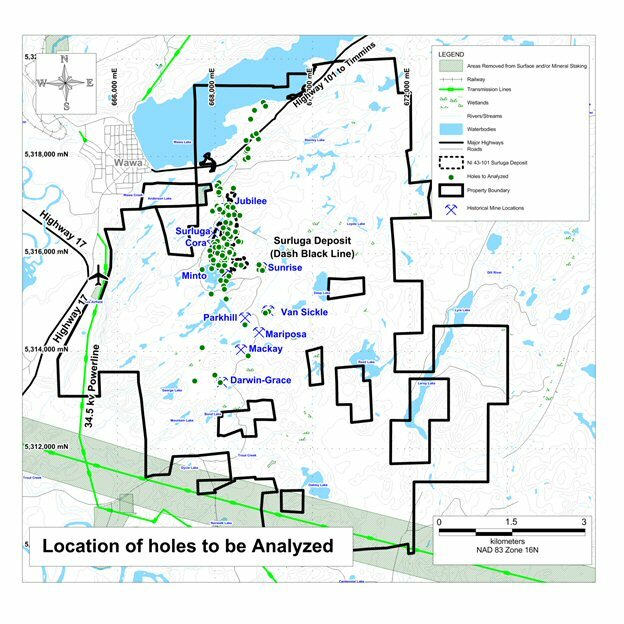 Red Pine has a 30% interest in the Wawa Gold Project and is part of a Joint Venture Agreement (JVA) with Citabar LLP and Augustine Ventures Inc. Under the terms of the JVA, Red Pine is the Operating Manager and continues to explore and advance the current gold resource on the property. On December 17, 2015, Red Pine and Augustine Ventures conjointly signed a Letter of Intent to merge. The merged exploration company will own 60% of the Wawa Gold Project. 1NI 43-101 inferred resource of 1,088,000 ounces of gold at a 1.71 grams per tonne (g/t) using a 0.40 g/t gold cut-off grade for pit-constrained and 2.50 g/t gold cut-off grade for underground-constrained resources (overall cut-off grade of 0.5 g/t), contained in 19.82 million tonnes open along strike and at depth. The Cut-off grades are based on a gold price of US$1,250 per once and a gold recovery of 95 percent (Mineral Resource Statement*, Surluga-Jubilee Gold Deposit, Wawa Gold Project, Ontario, SRK Consulting (Canada) Inc (effective May 26, 2015)). The report is available on www.SEDAR.com under Red Pine's profile.